Today we got up a bit late, Molly did a bit of whimpering around 3am. So much for tiring her out. 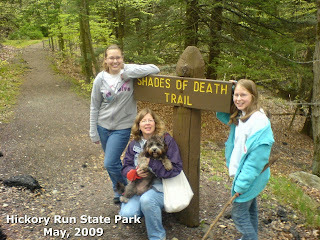 We roused and had egg, cheese, and english muffin sandwiches again, then we headed out by 9:30am to locate the "Shades of Death" trail, which begins near the Park Office, is only one and a half miles long, and is listed as "difficult". The Trail Winds along the Sand Spring Run, which courses it's way under a hemlock, white pine, and rhododendron forest. Add in amazing geological formations justting up, or smoothed by the running water, and you encounter God's creative beauty at each turn. 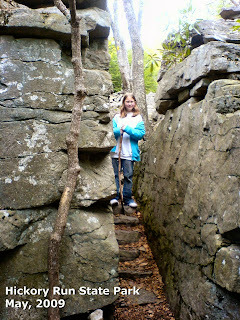 There are both natural and man-made waterfalls, and the trail was well maintained, with steps at times cut into the rock. At one point, we encountered small Cairns on a large flat rocky area, and we added our own. (forgot to take a picture!) I also showed the girls how native americals did "stone flaking" to make arrowheads and other cutting tools. We could have stayed here a good bit playing - but we moved on. Dry rock outcroppings, ponds, bog like - we encountered many diffrent microcosims in our short trek. At the trails end, we entered a meadow - edged with wild strawberry and violet flowers. We crossed the meadow - and found we were by the CCC dam that Amy and I had hiked to the prior afternoon. Am and I decided it best i hike back (using the road - a bit quicker) and pickup the car - and then meet she and the girls and they hiked onward toward RoadAbode. The hike, even though it was on Rt. 534 - was quite wonderfully solitary, and I did enjoy some views and interesting flora on my trek back. I got back to RoadToad, and by the time I drove to the campground, i ended up picking them up at the camp store. Everyone said the hike was the favorite part of our trip to Hickory Run. After our hike, we slowly started to ready RoadAbode for the ride home, packing up, and checking to be sure she was ready for the road. The girls and I took one short trip out - to the Stoney Point Firetower. Unlike when I was a boy, the firetower wan not only closed, but surrounded by 10 foot high chain link fence, topped by barbed wire. The Ranger house was also boarded up tight, and the girls were taking bets if they would see a bear on our last foray into the woods before we left. No bear, but plenty of low-bush blueberry bushes in bloom, and razzberry blooms as well. Looking back - the last time we were at the park was 2006 - and in May as well. A beautiful area, and a great weekend. Stone stepscut/placed in a crevase - which led up to where we found the Cairns. Part of the run, water smoothing the huge slabs. The Firetower - Access Denied! The firetower itself - high in the clouded sky.